There are many factors that can fuel the creativity of a brewer. One wellspring of creativity is an eagerness to learn. If a brewer begins to believe that they have learned all that they need to know, complacency may settle in, killing any sense of exploration or self-improvement. 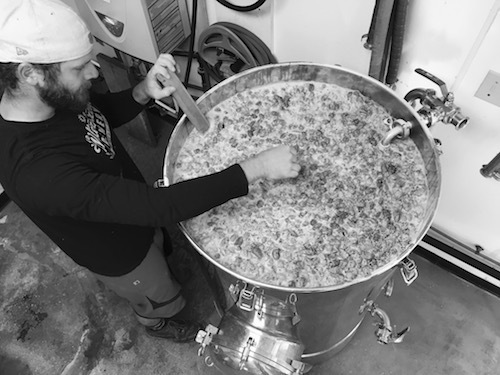 At Hidden River Brewing Company, the brewing philosophy is based on the idea that there is always room for improvement, and there are always new things to learn. The historic Brinton Lodge lived many lives before playing host to Hidden River. Located along a quiet road outside of Douglassville, PA, the original building was a farmhouse, built on a tract of land purchased from William Penn himself. In 1796, the property was purchased by the Kirlin family, who produced ammunition for the War of 1812. The Schuylkill River Canal was later routed through the property, and there were even rumors that the homestead was a stop on the Underground Railroad. In the early 1900’s, the wealthy Wittman family expanded the building into a 28-room mansion, which came under the ownership of hotelier Caleb Brinton during Prohibition. Brinton turned the property into an elite gentlemen’s club with a hand-picked clientele. Later, the Lodge became a popular restaurant, before eventually closing and remaining empty for several years. The current owners bought the Brinton Lodge with the intention of hosting historical tours and ghost events. The Lodge is widely touted as one of the most haunted sites in Pennsylvania, after all. A few members of the new owners’ family had a different idea. Kevin Margitich and Doug Reeser decided to take a leap of faith and turn a corner of the Lodge into a craft brewery. After a few bureaucratic problems stemming from the intricacies of operating two separate businesses in the same physical space, Hidden River Brewing Company was born. 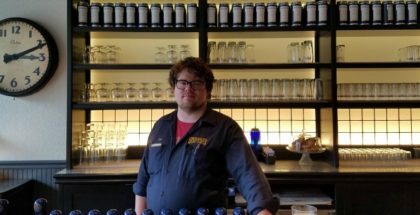 “Everyone likes to think they’re a smart person, and I was hoping I was.” – Kevin Margitich on his decision to open a Hidden River Brewing Co. Co-Founder and Head Brewer Kevin Margitich is hard at work on a brew day. Photo Credit: Hidden River Brewing Co. When the brewery opened in July 2015, Kevin and Doug had many years of home brewing experience between them. However, neither of them had brewed on a production scale. 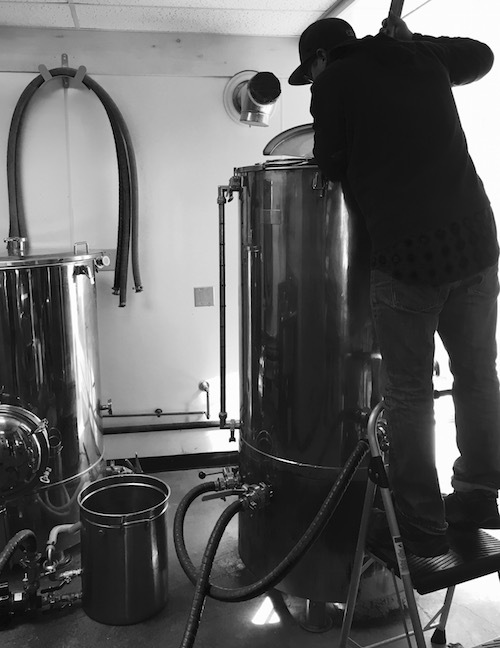 They had a steep learning curve ahead of them, as they learned the ins and outs of their new three barrel brew system. It was apparent to the partners that they had much to learn, and they made self-improvement the mission of Hidden River Brewing Company. No matter how well a brew turns out, they believe that there is always room for improvement. Their philosophy is also a way for Hidden River’s brewers to learn about larger scale brewing. Even though their brewhouse is tiny by commercial standards, it is much larger than their homebrew kettles. In this brewery, space is at a premium. It is so small that it is hard to work, even with just two people. They have learned to adapt by putting everything on wheels, rolling fermenters and bright tanks from place to place as they are needed. 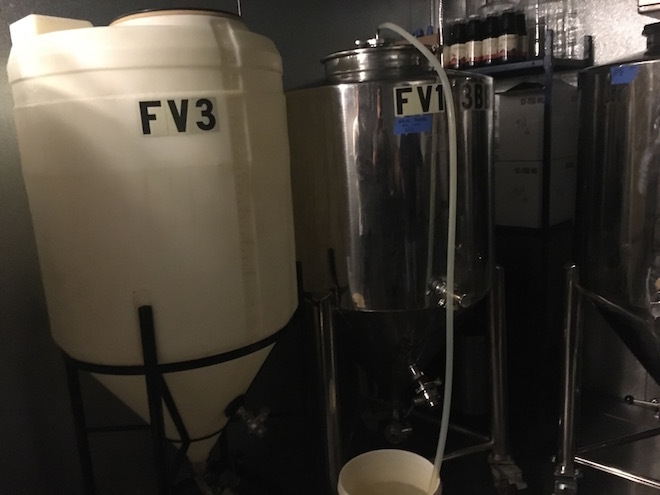 Continually seeking new tricks and techniques for using their brew system is another source of creativity, and the experimentation helps to hone their brewing skills. This corner of the brewery was so tiny, it was almost impossible to get a good picture. The eagerness to learn and improve means that Hidden River Brewing has never repeated a recipe. By the time you read this, they will have brewed over 180 different beers in just 15 months. This brewing philosophy seems to be a success because they are creating some tasty beers and have become a hit with the neighbors. With each new brew, a new lesson is learned, and that knowledge is put to use on the next brew day. Kevin and Assistant Brewer Josh focus heavily on IPAs and Saisons, but they have an underlying love of dark malts. They always like to have something dark on tap, whether it’s an Imperial Stout, a Brown Ale, or an English-style Bitter (one of Kevin’s favorites). Assistant Brewer Josh tending to the day’s brew. Photo Credit: Hidden River Brewing Co. While Kevin has been leading the charge in the brewhouse, Hidden River’s other co-founder, Doug, has been the guiding hand behind the pub itself. Hidden River serves a small food menu, which is prepared in an impossibly small corner of the bar. The menu is constantly changing and adapting to the availability of produce, meats, and cheeses from the local farms. Doug personally picks up all the food from the farms and helps craft the menu. Farm-to-table isn’t just a catch phrase around here. These local farms also provide a plethora of local ingredients with which to brew, such as ground cherries and watermelons. The taproom itself is located in the former kitchen of the 300-year-old lodge. The room has been stripped down to bare studs and brick, but visitors wouldn’t want it any other way. The rustic setting creates a unique experience for visitors. There are 12 beers on tap, and that number can expand to 16 when the patio is open. 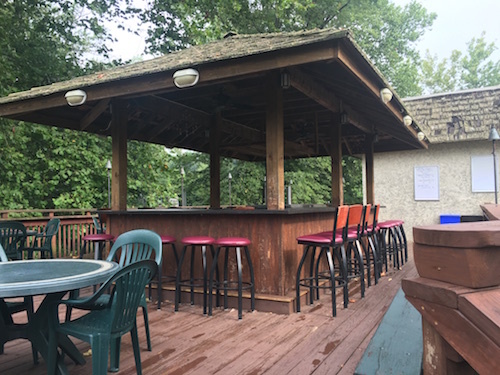 In order to show appreciation to their local regulars who congregate in the brewpub on Thursdays, Hidden River always tries to have something new on tap that day. Since seating has been opened on almost the entire first floor of its historic home, there is now room for around 200 patrons. The tap list at Hidden River (on 9/1/16). This has probably changed 5-6 times since then. To go along with its humble brewing philosophy, Hidden River has a similar plan for the future of the brewery. 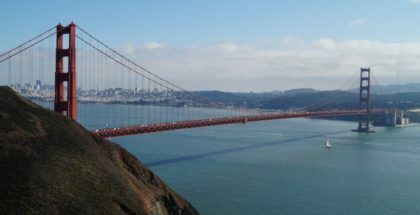 They are on a slow growth model, This ultimately means that they only want to grow at a rate that allows the business to remain sustainable, without incurring any new debt. This means that they must constantly be adapting and modifying their plan based on circumstances, just like they do on brew day. 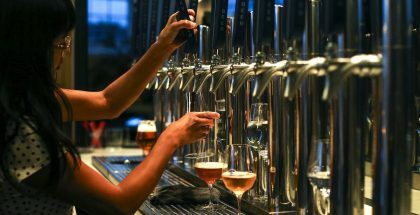 It’s necessary to weigh the pros and cons of every decision, as the staff seeks to create new, interesting beers and an inviting environment for their customers. “Would we rather get a glycol system, or improve the building’s bathrooms?” – Kevin Margitich on the kinds of “Slow Growth” decisions they have to make. From an outsider’s point of view, Hidden River Brewing Company does a great job at adhering to their core goals and philosophies. The beer is exciting, the taproom is inviting, and the staff is extremely friendly. If you ever find yourself in southeastern Pennsylvania, definitely make time to visit this innovative little brewery. Kevin is absolutely right when he says that his beer wouldn’t taste the same anywhere else. Maybe it’s the ghosts! 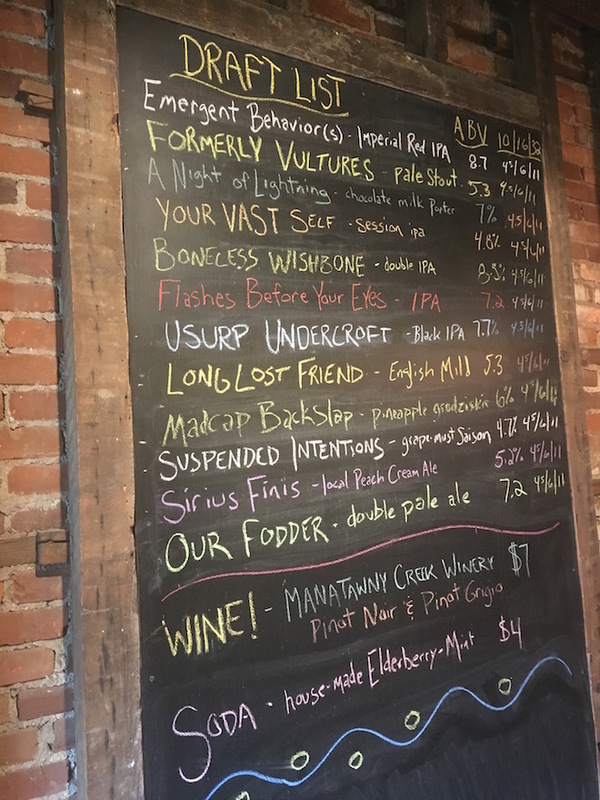 The tap list at Hidden River Brewing Company can change by as many as three beers per week, but this was the taplist two weeks before publication. It should give you some insight into the kinds of beers they are brewing. The patio at Hidden River Brewing Co. Some of the best Beers in PA. It’s not just brews but a Culture of Ales & culinary delights.